Facebook routinely tracks users, non-users and logged-out users outside its platform through Facebook Business Tools. App developers share data with Facebook through the Facebook Software Development Kit (SDK), a set of software development tools that help developers build apps for a specific operating system. Using the free and open source software tool called “mitmproxy”, an interactive HTTPS proxy, Privacy International has analyzed the data that 34 apps on Android, each with an install base from 10 to 500 million, transmit to Facebook through the Facebook SDK. • We found that at least 61 percent of apps we tested automatically transfer data to Facebook the moment a user opens the app. This happens whether people have a Facebook account or not, or whether they are logged into Facebook or not. • Typically, the data that is automatically transmitted first is events data that communicates to Facebook that the Facebook SDK has been initialized by transmitting data such as “App installed” and “SDK Initialized”. This data reveals the fact that a user is using a specific app, every single time that user opens an app. 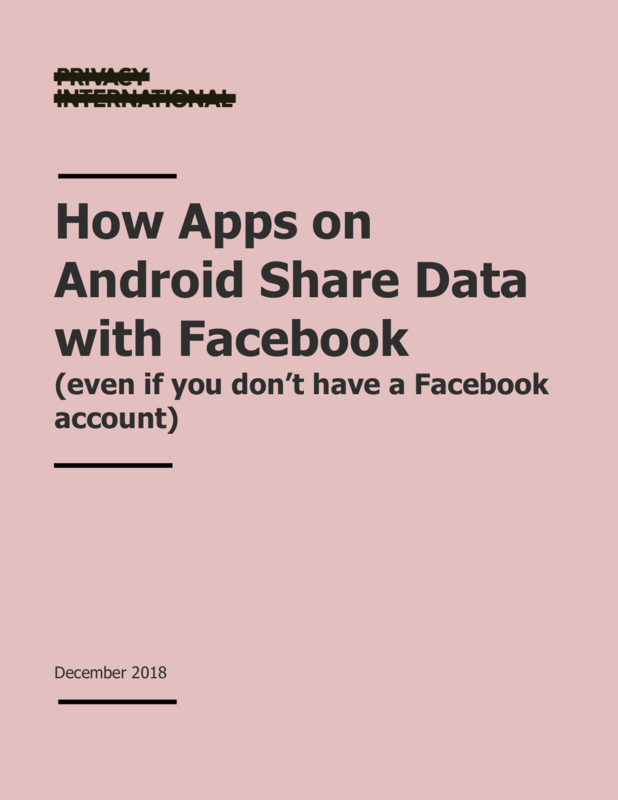 • In our analysis, apps that automatically transmit data to Facebook share this data together with a unique identifier, the Google advertising ID (AAID). The primary purpose of advertising IDs, such as the Google advertising ID (or Apple’s equivalent, the IDFA) is to allow advertisers to link data about user behavior from different apps and web browsing into a comprehensive profile. If combined, data from different apps can paint a fine-grained and intimate picture of people’s activities, interests, behaviors and routines, some of which can reveal special category data, including information about people’s health or religion. For example, an individual who has installed the following apps that we have tested, “Qibla Connect” (a Muslim prayer app), “Period Tracker Clue” (a period tracker), “Indeed” (a job search app), “My Talking Tom” (a children’s’ app), could be potentially profiled as likely female, likely Muslim, likely job seeker, likely parent. • If combined, event data such as “App installed”, “SDK Initialized” and “Deactivate app” from different apps also offer a detailed insight into the app usage behavior of hundreds of millions of people. • We also found that some apps routinely send Facebook data that is incredibly detailed and sometimes sensitive. Again, this concerns data of people who are either logged out of Facebook or who do not have a Facebook account. A prime example is the travel search and price comparison app “KAYAK”, which sends detailed information about people’s flight searches to Facebook, including: departure city, departure airport, departure date, arrival city, arrival airport, arrival date, number of tickets (including number of children), class of tickets (economy, business or first class). Since May 25, 2018 – the day that the EU General Data Protection Regulation (GDPR) entered into force – developers have been filing bug reports on Facebook’s developer platform, raising concerns that the Facebook SDK automatically shares data before apps are able to ask users to agree or consent. On June 28, 2018, Facebook released a voluntary feature that should allow developers to delay collecting automatically logged events until after they acquire user consent. The feature was launched 35 days after GDPR took effect and only works on the SDK version 4.34 and later. Possible new regulation for the supply chain space, hijacking DNS, and another Facebook privacy misstep. Catch up on the week's news with this roundup! Data classification, discovery, and encryption: We reached out to 18 security experts for insight on implementing a data-centric audit and protection program in an organization. A standing committee of the United States House of Representatives is requesting more money to properly secure federal cybersecurity and critical infrastructure in 2020.